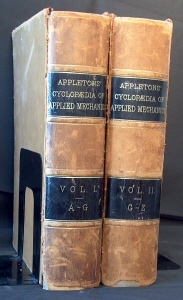 Appletons' Cyclopaedia of Applied Mechanics in 1880. In 1877, Thomas A. Edison was asked to update the section on the Telegraph for Appleton's Cyclopaedia of Applied Mechanics. At this point in his career, Edison was a respected telegraph inventor and former telegrapher. 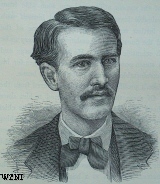 He submitted his article in the spring of 1878 when he was 31 and it was published in Appletons' 1880 edition. At the end of the section it credits, "T.A.E. in part," but, the majority of the section as published follows Edison's manuscript. 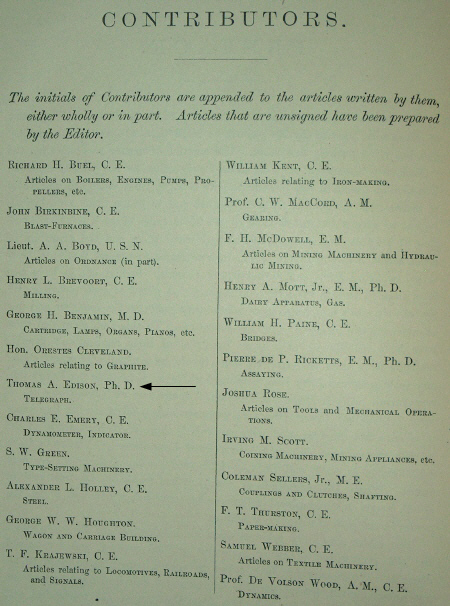 * Edison is the only person listed for the Telegraph on the page listing contributors. The section is shown below with enlarged images. 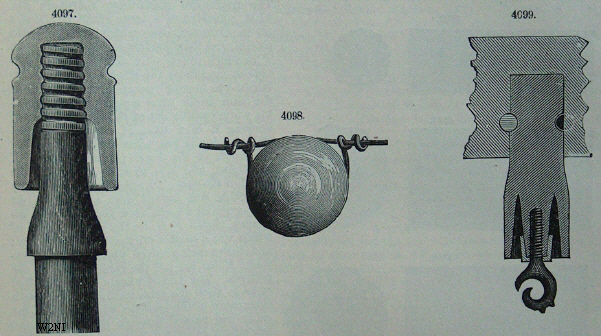 The Transmitter or Key, Fig. 4086, serves to connect and disconnect the circuit at a given point on the line, and by so doing to transmit signals. It consists of a brass lever L, swung on pivots, and having on one end a button. When this button is pressed down two platinum wires, a and b, are brought into contact, thus closing the circuit; when the pressure is removed a spring lifts the lever, separates the wires, and breaks the circuit. When the message is sent, the operator permanently closes the circuit by springing to the left the lever S, which brings into contact the duplicate platinum wires a' and b'. The signals are formed by breaking up the continuous flow into long and short intervals or waves—the short waves by a momentary depression of the key-lever, and the long waves by a depression of longer duration. These waves, passing over the wires to the distant station, actuate the recording mechanism, making long and short indentations on a continuous strip of paper. In practice, the magnet of the recorder or register is seldom influenced by the direct action of the current upon the line, especially upon lines of considerable length, as for example that between New York and Washington. Considerable power is required to effect the indentation of the paper, and a current of sufficient strength cannot be made to pass through such an enormous length of wire except by the use of a very powerful battery. To dispense with the use of the latter, and obtain sufficient power to effect the indentation of the paper, a magnet sensitive to feeble currents is substituted for the recording instrument in the line, and the latter is placed in a secondary or local circuit containing but a few feet of wire and one or two jars of battery. The Relay, Fig. 4088, is provided with a delicately-pivoted lever L, which is limited in its motion by two screws, the one on the right, b, being tipped with platinum, as is also the lever at a opposite to it. The spiral spring S serves to draw the lever away from the force of the magnet when the iron core ceases to attract the armature. The lever and point form part of the local circuit containing the register, and serve to stop and start the flow of electricity therein, in the same manner as the signaling key docs in the main circuit as previously described. The relay is therefore nothing more than a signaling key operated by electro-magnetism instead of by the hand of the operator. If a wave is sent from the distant station, the lever of the relay is attracted, the lever and point come into contact, closing the local circuit, influencing the register magnet, and causing an indentation to be made corresponding to the length of the wave. The relay lever, performing no work and making but the slightest movement, is set in motion by a current many times less in strength than that required to indent the paper. For the transmission of dispatches in either direction, a battery, key, relay, and register are required at each station; and any number of stations may be included within the same circuit or line, the attention of the operator at any particular station being called by frequent repetitions upon the line of a specific signal given to that station. Sounder, Fig.4089: The use of a strip of paper for recording the signals is falling gradually into disuse in this country, the signals being generally read by the sound which the lever of the register makes in striking its upper and lower limiting stops. The paper-moving mechanism is dispensed with, and a simple electro-magnet and lever used instead. This is called a sounder, and is shown in Fig. 4089. The armature A is attracted by the electromagnet M, causing the lever L to vibrate between the screws S S, which are so adjusted as to limit the vibrations. This apparatus is placed in the local circuit. In nearly all foreign countries a modification of the Morse register is used, which consists in substituting an inking wheel for the indenting point, and recording the dots and dashes by depositing ink upon the fillet of paper. Of late years many improvements have been introduced in the Morse Henry system, among which may be mentioned the repeater or translator for repeating the signals from one circuit or line into a second, or any number of circuits. It is impossible, as lines are at the present time constructed, to work between New York and Chicago direct; but by the use of repeaters a message may be transmitted from New York to San Francisco through repeaters stationed at Buffalo, Chicago, Omaha, Cheyenne, Ogden, and Salt Lake City. The principle of the repeater is the same as the action of the relay and register in a local circuit, as previously described. Upon transmitting a signal from New York, the electro-magnet at Buffalo attracts an armature and lever included in the circuit from Buffalo to Chicago. The connecting points are brought in contact, and a powerful battery stationed at Buffalo is put in communication with the Chicago wire. This causes the magnet at Chicago to attract its lever and close either a local circuit containing a sounder or another circuit extending to Omaha. MULTIPLE TELEGRAPHY.—The greatest advance in the above-mentioned system has been made but recently in the introduction of the duplex system by Stearns, and the quadruplex by Edison. By the use of the former apparatus two distinct messages may be transmitted over a single wire in opposite directions at the same time, without interfering with each other. This is attained by arranging the apparatus at each terminal station in such a manner that the transmission of a signal from one will not affect the apparatus at that station. This is accomplished by providing the signaling magnets with double coils wound in opposite directions, so that if a current be transmitted through one coil upon the magnet into the line, it is prevented from acting by the transmission of a current of equal strength through its extra coil into an artificial line. The effect of the current in each coil is to set up contrary magnetism, hence none is produced; but such a balance does not obtain at the other station, and therefore the signal is received. The transmission of a signal from the other station takes place in precisely the same manner. The quadruplex system, which transmits four messages at the same time over one wire, two in one direction and two in the other, is fast replacing the duplex both in this country and in Europe. By its aid two messages are transmitted by increasing and decreasing the strength of the currents at each terminal station, and the other two by altering the direction in which the currents flow at each. At each station there are two relay magnets, one of which responds only to strong currents independent of the direction in which they flow through the circuit, while the other responds only to a change in the direction of the flow. Multiple transmission is effected in various ways, too complicated to admit of description here. They will be found considered in detail in "Electricity and the Electric Telegraph," by George B. Prescott, New York, 1877. TYPE-PRINTING TELEGRAPH SYSTEMS.—The first printing telegraph brought into practical use was devised by Royal E. House of Vermont in 1846. It consists of two entirely distinct parts—the transmitter or commutator, and the receiver or printing apparatus. The transmitter is a toothed contact wheel, so arranged that when it is made to revolve the circuit is closed or broken 28 times. On the same shaft as this wheel is a cylinder, and on the cylinder are spirally placed 28 pins. The cylinder is arranged beneath a keyboard of 28 keys. When any key is depressed its detent is struck by the corresponding pin upon the cylinder in its revolution, and the motion of the latter together with that of the contact-wheel is arrested. Each key-, pin-, and wheel-contact corresponds to a letter, punctuation mark, or space. When the cylinder is turned from one letter to another, exactly such a number of contacts and interruptions are given as will bring a type-wheel in the receiving apparatus around to the same point. When the type-wheel stops, an eccentric forces a strip of paper against an ink band, and presses it against the type-wheel with sufficient force to obtain an impression of the letter which happens to be in position. The House apparatus was quite extensively used on some lines in this country between 1849 and 1860; but it has been gradually superseded by the Phelps instrument below described. The apparatus of this kind in most general use in France and Germany is that of Prof. Hughes of London (formerly of Kentucky). It is not used in this country. Two type-wheels are kept rotating synchronously together at each station, by means of a train of gearing provided with a governor. Connected to the mechanism is a transmitting cylinder, arranged with and controlled by a keyboard having a key for each letter of the alphabet. A printing lever, controlled by an electro-magnet placed in the main line, causes the printing of a letter upon a long fillet of paper, while the typewheel is rapidly moving. This movement is caused by the energizing of the controlling magnet by the transmission of a single wave from the distant station at the proper time. Simultaneously with the printing of a letter, the type-wheel, by the action of the printing lever, is thrown slightly forward or backward, thus correcting at every impression any slight variation in the synchronous movement of the transmitting mechanism of the wheel. The best apparatus of this character is that invented by Mr. G M. Phelps, and in use upon the lines of the Western Union Telegraph. It is known as the electro-motor telegraph. The train of gearing is replaced by a simple but powerful electro-motor, and the defects of the Hughes apparatus are entirely eradicated, and the speed of transmission greatly increased. 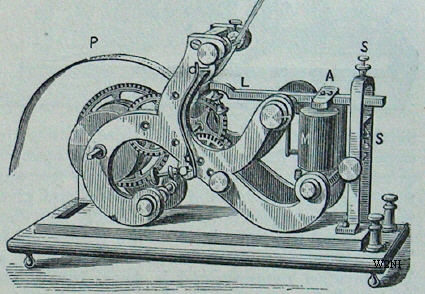 Like the Hughes apparatus, the transmitting device and type-wheel of the receiving instrument are caused to revolve synchronously under control of a governor, and each separate letter is printed by a single pulsation of the electric current, of a determinate and uniform length, transmitted at a determinate time; but, unlike the Hughes apparatus, the motion of the type-wheel is arrested while each letter is being printed, and it is automatically released the instant the impression has been effected. By this means a speed of transmission has been attained upon this instrument exceeding anything which has hitherto been regarded as possible. The Hughes and Phelps apparatus are only adapted for working on long circuits. Many simple printing instruments have been devised of late years for use upon short wires operated by private parties, and for transmitting from a central station market quotations to various parts of a city, recording the same by printing upon fillets of paper. Those generally in use have a type-wheel rotated by means of a lever which is vibrated by an electro-magnet actuated by the transmission of a series of pulsations within the circuit in which it is placed. The lever causes the type-wheel to revolve by means of a pawl and ratchet-wheel step by step. When a letter is to be printed, the wheel is brought into a proper position, and another electro-magnet attracts a lever and effects the impression. The printing magnet is worked independently of the type-wheel, either by increasing the strength of the current, by a sudden cessation of the rapid impulses which reciprocate the type-wheel lever, or by changing the direction in which the current flows through the circuit. Printing instruments for private use have also been invented which work upon the magneto-electric principle, dispensing with all batteries, the currents being generated by magnetic induction set up in the act of transmitting the message; but this form of apparatus requires a constant power to be applied to generate the currents. The needle system of Wheatstone, once exclusively used upon the English lines, is fast growing obsolete, being replaced by the American system. THE MIRROR SYSTEM—The most delicate of all known telegraphic systems was invented by Sir William Thomson, and is exclusively used on long submarine cables. The signals are read by the deflections of a spot of light to the right or left of a zero point upon a scale. In the centre of a bobbin of fine insulated wire, included in the cable circuit, is placed a small thin mirror a quarter of an inch in diameter, and suspended by a single fibre of silk. To the back of the mirror is secured a piece of thin steel highly magnetized. A beam of light from a lamp is thrown upon the mirror within the coil. This beam is reflected back to a paper scale some three feet distant, and there shows as a long, thin spot of light. The passage of a current over the cable and through the bobbin causes the magnetized Billing and mirror to be deflected to the light or left according to the direction of the current, and the movement of the spot in various directions serves to give the necessary signals to form the message. The general arrangement of apparatus is shown in Fig. 4090. In the centre of the bobbin is the circular mirror which carries the magnetized needle, rendered astatic by the magnet E fixed to a vertical rod above the galvanometer. C is the commutator of the apparatus, B the manipulator, with two keys. To the negative currents correspond the deflections of the needle and mirror to the left; to the positive currents, those to the right. F is a darkened chamber inclosing the scale on which arc formed the images of the flame of the lamp situated behind it. The luminous beam passing through a hole in the side of the chamber follows the path R, falls upon the mirror, and is reflected to the zero of the divided scale, when the mirror is unmoved. At each passage of the current sent through the cable, the mirror oscillates as already described. At A is a battery of Daniell's elements, and at J the communication is made with the earth. A modification of this instrument is the beautiful siphon recorder, also invented by Sir William Thomson. This apparatus is so arranged as actually to delineate upon paper the very irregular movements of the mirror-galvanometer needle. Fig. 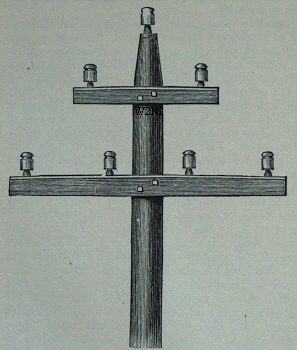 4091 shows the form of siphon recorder in use upon the French Atlantic cable. The apparatus consists of a very light rectangular coil, b b, of exceedingly fine insulated wire, suspended between the poles of a large and powerful electro-magnet N S, which is charged by a local battery of large size. Within the coil is a stationary soft-iron core a, which is powerfully magnetized by induction from the poles N S. The coil b b swings upon a vertical axis consisting of a fine wire f f1, the tension of which is adjustable at h. The received currents puss through the suspended, coil, the suspension wire f f1 serving as the conductor; the coil is impelled across the magnetic field in one direction or the other, according to the polarity and the strength of the current passing through it. The magnetic field in this apparatus is very intense and very uniform, which makes the apparatus sensitive to the weakest currents. The siphon n consists of a fine glass tube turning upon a vertical axis I. The shorter end is immersed in the ink-reservoir m, and the longer end rests upon the paper strip o o. The siphon is pulled backward and forward, in one direction by the thread k, which is attached to the swinging coil b b, and in the other by means of a retracting spring attached to an arm on the axis I, and controlled by an adjusting spindle. The paper is caused to move at a uniform rate by means of gearing driven by a small electric engine. Fig. 4092 is a facsimile of the writing of the siphon recorder, at a speed of 18 or 20 words per minute through a cable 800 miles in length. The upward waves represent dots, and the downward waves dashes. The international alphabet is here used, which is slightly different from the American alphabet. In working very long cables, the action of the current upon the swinging coil is very feeble, and the friction of the siphon against the paper strip, if allowed to come in actual contact with it, would interfere with the freedom of its movement. In such cases the point of the siphon does not actually touch the paper; the ink and the paper arc oppositely electrified by an inductive machine driven by the same electric engine that moves the paper, and the electrical attraction causes the ink to be ejected from the siphon on to the paper. The Autographic System.—By means of this system messages may be transmitted in the handwriting of the sender, and pen-drawings may also be sent. The most successful types of apparatus are those invented by Cassells and Meyer, both of which are in use upon one or two lines in France. The Cassells apparatus consists of two large pendulums kept swinging in unison by electro-magnets placed in the line-wire. One pendulum transmits electric waves at certain intervals, which, acting upon the magnets, cause them to correct any variation from exact unison of swing. Connected to one pendulum is the transmitting and receiving apparatus. The message for transmission is written upon metallic foil with a non-conducting ink; this is laid upon a platen connected to the earth through a battery. A fine platinum wire connected to the line-wire is reciprocated from one end of the toil to the other, the foil being advanced one-hundredth of an inch after each reciprocation until the point has passed over the whole of the foil. The platinum point when passing over the foil allows the current from the battery to pass over the line. At all points, however, where it passes over the non-conducting ink with which the message is written, the current is prevented from passing into the line. At the distant station a similar point is reciprocated over a platen, upon which is laid a sheet of chemically-prepared paper; the passage of the circuit through the reciprocated point and moist ened paper causes a blue mark to appear. If both pendulums arc started at the same instant, the form of the metallic foil upon which the message is written will be reproduced upon the chemical paper by blue line:s blending one into the other. But owing to the non-transmission of any cjrrent where the transmitting point passes over the non-conducting ink, no mark will appear; hence the message will be inscribed in white characters upon a blue ground. By an ingenious device Cassells reversed this action and caused the characters to recorded in blue upon a white ground. The manner of preparing the message, as well as the complication of the apparatus, has prevented the general adoption of this system. The apparatus invented by Meyer is more simple than that of Cassells. Recording by chemical action is replaced by a record with ink. At each station the synchronously-moving iron style is replaced by a rotating cylinder, a single spiral rib on which glides over the foil, on which the communication is written as before. At the receiving station an ink-roller revolves in contact with the edie of the screw-thread, and just beneath the cylinder is a band of paper which advances synchronously with the foil sheet at the sending station. At the latter the current is sent to the line as often and as long as the screw comes in contact with the non-conducting writing on the tin foil. At the receiving station the current passes through an electro-magnet, whose action raises a platen located directly under the cylinder, and the paper, pressing the latter against the inked edge of the Bcrewthread, thereby produces an impression. AUTOMATIC SYSTEM.—In these systems the transmission and reception of the message over the wires are conducted entirely by automatic machinery. There are three in use, those of Wheatstone, Siemens-Halske, and Edison. All are based upon the same principle as that of the controlling cards of the Jacquard loom. Three essential devices are embodied: (1), the perforator or puncher, for preparing the message by perforating the characters in the strip of paper; (2), the transmitter, for causing such characters to be sent in the form of electric waves through (3) the receiver, which carries forward a strip of paper, upon which the characters are recorded either by chemical decomposition or by ink. The Wheatstone punchers consist of three keys, one for the dot, one for the dash, and one for feeding the paper forward a short distance after each letter has been perforated. The paper is prepared at a speed of from 18 to 20 words per minute. The Sicmens-Halske perforator is similar to the Wheatstone. The Edison perforator consists of a keyboard of 28 keys. The depression of a key perforates the letter entire, and feeds the paper the proper distance forward. The paper is prepared at a speed of from 35 to 50 words per minute. 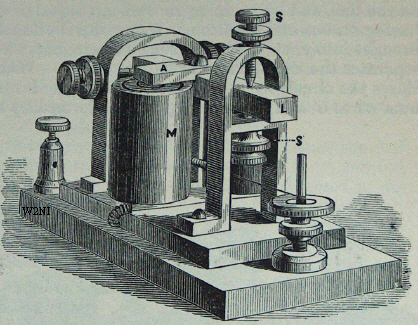 The Wheatstone transmitter consists of a clock movement, which sets in rapid vibration two rods, which operate by levers to open and close the electric currents, and which when the strip contains no perforations strike against the paper, and are thus limited and prevented from transmitting a wave over the wire. When a perforation occurs, the rod or rods pass upward through the hole. Having thus greater latitude of movement, they allow the circuit-closing levers to come in contact, and a wave is transmitted. The action of one rod serves to transmit a wave in one direction, while the action of the other rod serves to transmit it in another, so that the characters are sent by reversals of the direction in which the circuit flows through the line; a fact necessary with this system, owing to the peculiar arrangement of the receiving apparatus. Accurate feeding of paper is attained by using a supplementary row of holes placed at equal distances from each other, and the paper is carried forward by a toothed wheel engaging the holes. Fig. 4093 is a specimen of a perforated strip used in the Wheatstone system. The perforations which regulate the contact-making portion of the transmitting apparatus are represented by the larger circles, while the centre row of holes is represented by the smaller circles. By this row of holes the paper is carried forward on the transmitter. The slip is perforated for the letter R of the international alphabet. The transmitter of the Sieniens-Halske system consists of a magneto-electric apparatus. The currents necessary for signals are obtained by induction, and pass over the wire alternately in one or the other direction. The transmission of the currents so generated is regulated by the groups of perforators. 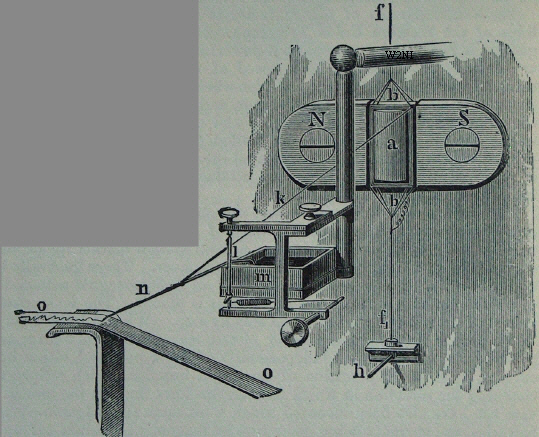 In Edison's system the transmitter consists of a drum rotated by a crank connected to the battery and earth, and which serves to carry the paper forward with great rapidity. Resting on the paper is a double spring tipped with small platinum wheels. These are both connected to the line, and arranged so that they will come in contact with the drum where a hole in the paper passes under them, thus connecting the line with the battery. Fig. 4094 shows a strip perforated with Edison's apparatus. The first group of holes represents a dash, and serves to transmit a long wave. The upper perforation is used in conjunction with one wheel, to bridge over the intervals between the two lower perforators by keeping the line in contact with the drum while the other wheel is passing the space between the two smaller holes. The receiving apparatus employed by Wheatstone consists of a clockwork for drawing the paper forward on an electro-magnet which gives motion to an ink-wheel. The electro-magnet is polarized by having its core made permanently magnetic; hence it responds only to signals formed by reversing the direction of flow of the current through the wire A positive current, for instance, causes the polarized magnet to bring the ink-wheel out of an ink-reservoir and up to the paper, so that it continues to deposit ink upon the latter until a negative current is transmitted, which causes the magnet to attract the lever and ink-wheel away from the paper. This system is employed only in England. The highest speed is 180 words per minute on short lines. The average speed on all lines is 100 words per minute. The receiver of the Siemens-Halske system is similar to that of Wheatstone, and the speed about the same. The receiver of Edison's system is an electro-chemical one, the characters being formed by the electric decomposition which takes place when a current of electricity is passed through moistened paper by means of a metallic wire resting upon it. A drum rotated by a crank serves to carry forward the moistened paper. The drum is connected to the earth. A wire resting upon the paper is connected to the line; the wire (usually brass) is tipped with metallic tellurium. When no current passes through the line, point, paper, and drum, no mark is made; but if a single wave is transmitted, the passage of the current through the moistened paper causes the decomposition of the water, setting free oxygen and hydrogen. The hydrogen combines instantly with the tellurium to form hydrotelluric acid, and almost but not quite simultaneously the acid is decomposed by the action of the air, depositing finely-divided tellurium upon the paper, and leaving a very blackish brown mark the width of the wire, and of a length equal to the length of the electric wave transmitted. The characters arc recorded with extraordinary rapidity, 3,150 words having been transmitted from Washington and recorded by this means in New York in one minute; and the characters are so sharp and clearly defined that a sentence of four words can be recorded in the space of one-eighth of an inch. Another modification consists in using an iron point and moistening the paper with chloride of sodium and ferrid-cyanide of potassium. The passage of the current causes the formation of protoxide of iron on the point, and the ferrid cyanide combines instantly with it to form Turnbull blue. The results are not equal to those of the tellurium point. An important adjunct to the system, by means of which high speed in transmission is obtained, is the use of a compensating system, whereby the retarding effect known as the static or after charge is rendered null on lines of ordinary length. The compensator consists of a series of electro-magnets contained in an artificial line at both the transmitting and receiving stations. The passage of the current through the line transmitting the signal sets up the static or after charge, while its passage on the artificial lines charges the magnets, which upon the cessation of the main circuit (the extra current from the magnet having a tendency to pass into the main line in one direction) is balanced by the tendency of the static or after charge to pass in the opposite direction. Hence, the moment the battery is disconnected from the line, the signal upon the chemical paper ceases. Were no compensation used, the characters would at high speed be so polarized as to run into each other and make a continuous unintelligible mark. This system has been in use for a number of years in this country. Many other automatic systems have been devised, but those above mentioned are the only ones that have come into extended use. Automatic Typo-Telegraph Systems.—In these systems Roman letters are transmitted and recorded instantaneously. The first system invented was that of Bonnells, Fig. 4095. The transmitter consists of a traveling carriage moved by power, the message being set up in type, which are connected to the battery and to earth. A comb M, of five points, is placed in line with the type, so that the passage of the type under the comb causes the prongs to touch all parts of the letter as they pass rapidly under it. Each prong is connected to a wire; hence five wires united in the line L arc employed between the transmitting and receiving stations. At the distant station a similar comb N, of five prongs, is used, the tips being formed of platinum. These rest upon paper moistened with a solution of nitrate of manganese or iodide of potassium. The paper, which is a continuous strip, is carried forward by a train of wheels. In the transmission of the letter I, for instance, the five prongs at the transmitting station come in contact with the letter simultaneously; hence each wire receives a short wave, which, passing over the line and through the points upon the chemical paper, causes a decomposition of the manganese salt, leaves five dots one above the other, and thus forms the letter I. In the case of the letter T, the upper pen comes in contact with the top portion of the T at times when the other four do not touch the type. Hence the first point transmits a long wave, which is recorded by the top point at the receiving station, while no current is transmitted on the other four wires except when all the points come in contact simultaneously to form the lower part of the letter. By this system a rate of speed equal to 1,000 words per minute has been attained on short lines. The American system devised by Edison is based upon the same general principle as that of Bonnells, but the devices are entirely different. Instead of setting up type to transmit the message, the letters are formed by groups of holes perforated in fillets of paper by a perforating machine. This machine consists of a die with 25 holes massed in a square into which 25 punches fit. Each punch is connected to a separate long thin bar. These bars are provided with pins at certain intervals, by means of which the bars necessary to form a letter are carried forward by the depression of a key. There being 28 keys in all, a single depression serves to perforate an entire letter and feed the paper forward. The average speed of perforation is from 35 to 50 words per minute, although a speed of 90 words has been attained by a very expert operator. Two wires are employed for transmitting the characters; but one-half of a letter is transmitted at once. The record is made upon chemically prepared paper, as with the Bonnells system. A speed of 1,200 words per minute has been attained with this system between New York and Philadelphia. 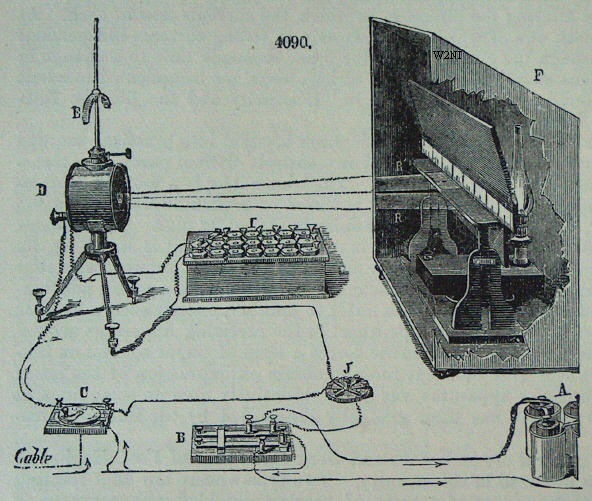 Acoustic Telegraph.—This system is now (1879) being developed. The principle upon which it operates is the transmission of several series of electric waves simultaneously over a single wire, by means of tuning-forks or reeds adjusted to a definite pitch or rate of vibration, and the reception and analysis of these waves by similar tuning-forks or reeds at the distant station. The most successful system is that of Elisha Gray. This consists of several reeds, each tuned to make a certain number of vibrations per second. Each reed is provided with electric contact-springs, which act to throw in and out of the line a small battery at each vibration. Each reed is also kept in continuous vibration by an electro-magnet local battery and a supplemental contact-spring. The vibrations of the reed serve to open and close the circuit of the magnet which gives it motion, in the same manner as the automatic circuit-breaker of an induction coil. A Morse key is connected with each reed, to enable the operator to stop and start the waves over the wires. The different series of waves which pass over the wires simultaneously are separated or sorted out, so to speak, at the distant station by means of reeds tuned to the same pitch as the reeds at the transmitting station. Hence, if at the transmitting station five reeds are in vibration and are transmitting their waves over the wires, the five corresponding reeds at the receiving station will be set in vibration by the action of these waves on the electro-magnet with which each reed is provided. If now, by the depression of a Morse key connected to any reed, the wave from it is prevented from passing over the line, the reed at the distant station tuned to respond only to this series will come to rest almost instantly, notwithstanding the fact that the other waves are energizing its electro-magnet; the reason being that the reed can only be made to respond to waves which follow each other at certain definite rates, and which correspond to its proper tone. By suitably manipulating the keys Connected to each reed, several messages may be transmitted simultaneously, the characters being received by the discontinuous musical Found given out by the receiving reeds when they are stopped and started. Bell, Edison, La Cour, and Varley have each acoustic systems similar in principle to that of Gray; but none have been so perfected as to come into actual use. FIRE ALARM and DISTRICT TELEGRAPH SYSTEMS.—These systems are employed for local telegraphing, usually in large cities. The former serves to transmit from various parts of a city to a central station a fire signal, which is retransmitted by automatic machinery to various towers containing bells controlled by electro-magnets and operated by wires connected to the central station. The district telegraph system is the same in operation and principle, and is used for connecting telegraphically a central office with private dwellings, stores, etc., to enable the owners to call to their aid either a messenger, a policeman, or the fire department. The apparatus for transmitting the signal (which is generally a number) consists of a metallic wheel provided with a number of suitably arranged teeth. The spaces between the teeth are filled with a non-conducting substance, such as ivory. Resting on the rim of the wheel is a contact-spring, which is connected to one end of the line and the wheel to the other. By means of a lever which is moved through a considerable distance by the sender of a signal, a spring is wound up sufficiently to sot a train of gearing in motion and give the character-wheel several rotations. This causes the signal to be repeated over the wires many times. At the receiving station an automatic Morse register is set in motion by the first signal, and records the subsequent signals by indentations on the paper. This signal is at once seen by the operator in attendance, and is by him retransmitted to all the towers containing alarm-bells, where it is reproduced and made audible throughout the city. 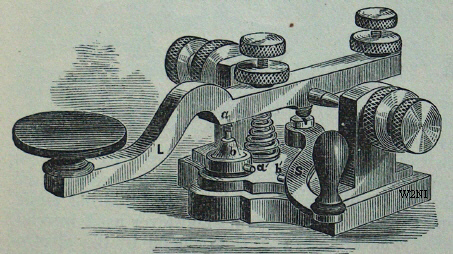 In the case of the district telegraph, the signaling apparatus is so arranged that when the lever is carried round for a given distance the character wheel is caused to give one revolution, which signifies a messenger; if moved still farther to a marked point, the wheel makes two revolutions and repeats the signal, which signifies that a policeman is wanted; and if the lever is carried to its full limit, the wheel gives three revolutions, repeating the signal three times, signifying that the fire-extinguisher is required to extinguish an incipient fire. Wire - The best wire for telegraphic purposes is made from pure Swedish charcoal iron, and is galvanized to protect it from oxidation. The most usual sizes are No. 9, weighing 323 lbs. to the mile, and No. 8, weighing 389 lbs. to the mile. Many of the more important lines of the Western Union Telegraph Company are now built of No. 6 wire, weighing 570 lbs. per mile. In jointing, the end of each wire is closely turned around the other four or five times and then cut off short. The joint is finished by dipping in melted solder. Poles - In this country timber is used for poles. In Europe light iron structures or wood saturated with preservative solutions are employed, the scarcity of timber rendering economy in its use necessary. In the United States, chestnut, white and red cedar, and redwood are chiefly utilized. Chestnut and white cedar will last for 18 years; red cedar has remained unimpaired for 25 years. Poles are seldom less than 26 ft. long by 6 in. in diameter at the top. When of this size they carry from 7 to 9 wires. On important routes their length sometimes reaches 90 ft. They are usually placed about 176 ft. apart, numbering 30 to the mile. The cross-arms are of seasoned white pine, 4 by 5 in. thick, and varying in length according to the number of wires carried, usually from 3 ft. for two wires to 7 ft. 6 in. for six wires. The practice is to place all the arms on the same side of the pole, at distances of 22 in. apart between centres. Fig. 4096 is an example of the standard style of construction in the United States, the pole being arranged to carry seven wires. Insulators - The following, according to Prescott, are the essential qualities of a good line insulator: "The material of which it is composed must itself be possessed of high insulating qualities, and should not be subject to decay or deterioration from long-continued exposure to the weather. The surface must be repellent of moisture and not liable to retain dust or smoke. The form should be such as will interpose the greatest possible insulating surface between the line-wire and the cross-arm or pole, compatible with the necessary mechanical strength for supporting the wire. The following materials are most commonly used for insulating purposes: Glass, glass with an iron covering, vulcanized rubber, brown earthenware glazed, same in combination with vulcanized rubber, white porcelain, and baked wood prepared with sonic resinous compound. Fig. 4097 represents a glass insulator, provided with a screw-thread which fits upon a thread cut upon the wooden supporting-pin. By this arrangement the insulator is prevented from being drawn off the pin by an upward strain, or by the action of the wind on the wires. The mode of attaching the wire is shown in Fig. 4098. The average percentage of glass insulators broken on the lines of the Western Union Company for a period of four years was 6.4. Fig 4099 is an insulator of whitewood impregnated with a non-conducting compound, and arranged to hold the wire by suspension. UNDERGROUND TELEGRAPH LINES A valuable report on this subject was made in 1879 to the Chicago City Council, by Mr. J. P. Barrett, superintendent of the city telegraph system, from which the following facts are taken: "The principal portion of the telegraph wires in the leading cities of Europe are laid underground, and in the city of London there were in 1875 3,500 miles of underground wire belonging to the government telegraph system; and in Paris, about the same date, all the wires were underground. In Germany there are several underground telegraph lines, between one city and another. For instance, Berlin is connected with Hamburg, Mayence, Strasburg, Cologne, and many other cities by underground lines the entire distance. The cables contain from five to seven conductors each, insulated with gutta-percha, and the whole protected with an armor of iron wires. This system has shown itself in practice to be both economical and reliable. There arc in Paris working lines that have been buried for 25 years, and which have been the cause of little or no expense. 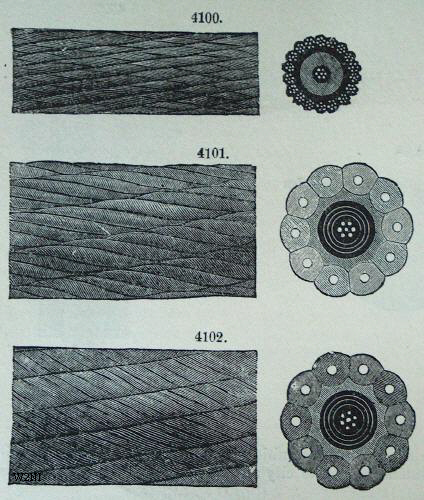 The different systems of underground wires hitherto employed are these: The larger proportion of the work which has been done has consisted of copper wire, insulated first with gutta-percha, and the gutta-percha protected from the action of the atmosphere by a covering of tar and tarred tape. The wires so protected are bunched together in a sort of cable and drawn through an iron pipe. In some cases the wires, after being insulated with gutta-percha, are protected by a series of galvanized iron wires, laid spirally around the cable. The pipes containing the wires have been generally laid in the ground at a depth of 2 1/2 or 3 ft. below the surface. In Paris the cables are coated with a lead covering and hung in the sewers. Another method of insulating and protecting underground wires has been by the use of an insulator known as kerite, which is a form of vulcanized rubber especially adopted as a telegraph insulator; and the capper wires, after being insulated with kerite, are laid in lead or iron pipe or wooden boxes under the ground. Another method, by Professor Brooks of Philadelphia, has been successfully employed, which consists in covering the copper wire by winding or braiding with cotton thread, depriving the thread of its moisture so as to secure a high degree of insulation, bunching the wires together, as many as are required on a given route, drawing them into an iron pipe, and filling the pipe and keeping it full of specially prepared paraffine oil, which serves to keep out moisture from the pipes and to insulate the wires." In London the cost of laying 60 underground wires was £23 8s. 7d. per mile of wire. SUBMARINE TELEGRAPH CABLES The design and construction of a submarine cable vary with the circumstances under which it is used. Near coasts where the sea is shallow and the cable is exposed to accidents from the waves, the size of the line is greatest, while in deep water the smallest diameter possible is used. The conducting wires are completely insulated from the iron envelope outside, and from each other, by layers of gutta-percha. The wires are usually of copper, and after being covered with gutta-percha they are subjected to the most careful tests for conductivity before being made into cable. Between the gutta-percha and the iron which forms the protecting envelope is placed a layer of hemp, technically termed the bedding. The conducting wires, usually seven in number, are twisted into a single strand; this is covered with the hemp bedding soaked in Stockholm tar, and outside of this is a series of galvanized iron wires twisted into spiral form. Figs. 4100, 4101, and 4102 represent the Atlantic cable from Valentia to Newfoundland, showing the various sizes at two-thirds their actual dimensions. The laying of a submarine cable involves much special machinery. For the laying of the Atlantic cable in 1866 the Great Eastern was employed, the immense size of the vessel adapting her especially to the work. The cable itself was coiled in three circular iron tanks built on the main deck of the ship, as shown in Figs. 4103 and 4104. The largest of these tanks was 58 ft. 6 in. in diameter, and all were of a uniform depth of 20 ft. 6 in. In these tanks the cable was coiled, the coiling beginning at the outside. In order to prevent depreciation of its gutta-percha coating and to allow of its electrical condition being effectually tested, the cables while thus stowed were kept submerged in water. The paying-out machinery, shown in rig. 4100. 4104, consisted of a large wheel E, about 4ft. in diameter, over which the cable was passed, and then conducted through a trough F in which rollers were placed. In the paying-out machinery the chief object to be attained was to supply some means of checking the cable in the most regular manner possible while passing out of the ship, and also of keeping it in a state of constant tension. This tension it was necessary to regulate by the depth of the water in various parts of the ocean, and also to some extent by the speed of the ship. On entering the machinery the cable was passed over a series of six deep-grooved wheels, each about 3 ft. in diameter, shown at G, on the shaft of each of which was placed a friction-disk and strap; and above each grooved wheel was a jockeywheel which pressed the cable down into the grooves. The jockey-wheels could be lifted so as to allow the cable to slip freely through the groove in the carrying-wheel. After the cable had passed through this part of the machinery, called for distinction the "jockey-gear," it was led to the main paying-out drum P, over which it was passed four times. On the shaft of this drum was placed the main friction gear, an ingenious self-adjusting arrangement of Appold's brakes. The cable, having been sufficiently checked by the means described, was passed over the stern-wheel A into the sea, and on its way the actual strain was measured by a dynamometer placed at D. Immediately after leaving the drum the cable passed over two wheels, one of which is shown at I, and between these wheels the dynamometer was placed. The paying-out drum was supplied with steam-power for reversing its action and picking up the cable, should any fault occur requiring such an operation. In paying out the cable, the portion iu the after tank was first taken, then the fore tank was emptied, and the middle tank was left to the last, the ends of the cable from the several tanks having been spliced together in that order of connection. The whole of the cable in the three tanks was spliced into one length before the paying out commenced. The total length of cable paid out was 1,851 knots, and the time from shore was 14 days, giving an average of 132 knots a day paid out, and an average rate of 5 1/2 knots an hour for the cable. The total distance run was 1,669 knots, making the average proportion of slack paid out 11 per cent. Works for Reference "Experimental Researches in Electricity," Faraday, London, 1839-'55; "Traite' de la Telegraphic Electrique," Moigno, Paris, 1849; "Der Elektromagnetische Telegraph," Sehellen, Brunswick, 1850-'68; "The Electric Telegraph, its History, etc.," Highton, London, 1852; "Historical Sketch of the Electric Telegraph," Jones, New York, 1852; "The Electro-magnetic Telegraph," Turnbull, Philadelphia, 1853; "Telegraph Companion," Shaffner, New York, 1854-'5; "Telegraph Manual," Shaffner, New York, 1859; "History, Theory, and Practice of the Electric Telegraph," Prescott, Boston, 1859; "Telegraphie Electrique," Gavarret, Paris, 1852; "Electrical Accumulation and Conduction," Webb, London, 1862; "Telegraphie Electrique," Dumonccl, Paris, 1864; "History of the Atlantic Telegraph," Field, New York, 1866; "The Telegraph Cable," Grisconi, Philadelphia, 1867; "The Electric Telegraph," Sabine, London, 1867; "Reports of United States Commissioners to Paris Exposition of 1867: Review of Telegraphic Apparatus," by Prof. S. F. B. Morse, Washington, 1868; "On Electrical Measurement," Clark, London, 1868; "Der Bau von Telegraphenlinien," Ludewig, Leipsic, 1870; "Hand-Book of Practical Telegraphy," Culley, New York, 1870; "Electrical Tables and Formula;," Clark and Sabine, London, 1871; "Das TelegraphenRceht," Meilli, Zurich, 1871; British Association's " Report on Electrical Standards," Jenkin, London, 1873; "Guide to the Electric Testing of Telegraph Cables," Hoskioer, London, 1873; "Telegraph and Travel," Goldsmid, London, 1874; "A Manual of Telegraph Construction," Douglas, London, 1875; "Electricity and the Electric Telegraph," Prescott, New York, 1877. See also list of works cited under Electricity. T. A. E. (in part). * "The article as published follows Edison's manuscript very closely. However, sections on Cowper's writing telegraph (not shown here) and on telegraph construction, as well as a bibliography, were added by Benjamin. As a result the article is signed T.A.E. in part." Ref. : The Papers of Thomas A. Edison, Book Version, Volume 3, Menlo Park: The Early Years, Rutgers.